This document provides a brief outline on how to configure the deployment of PDAgent via Active Directory Group Policy. In the menu bar, choose Tools > Add database settings to msi file. 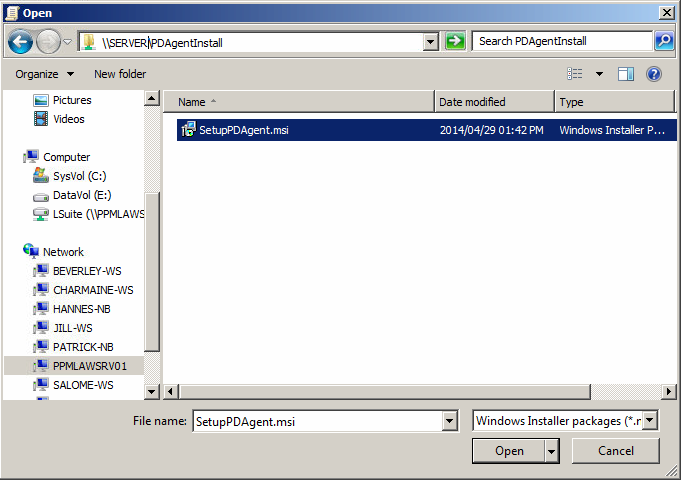 Navigate to where the SetupPDAgent.msi file is saved and click Open. A message will be displayed stating whether inserting the settings was successful. Now that the SetupPDAgent.msi contains the database connection settings, it must be moved to a folder on a server (preferably the Active Directory server) that is shared with read access for the user group to which it will be deployed (e.g. Everyone or Domain users). It is also sometimes necessary to add the Domain Computers security group to the read access permissions of the shared folder. Open Control Panel > Administrative Tools > Group Policy Management. Choose the OU which contains the Computer Objects which will receive the installation. 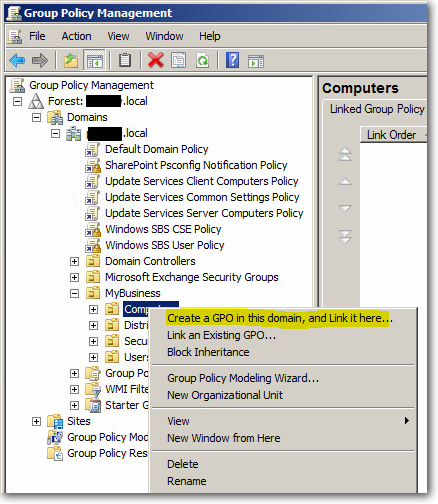 Right click it and choose Create a GPO in this domain, and Link it here… (below is an example). Give the new GPO a descriptive name. Now the Group Policy Management Editor will open. Navigate to Computer Configuration > Policies > Software Settings > Software installation. 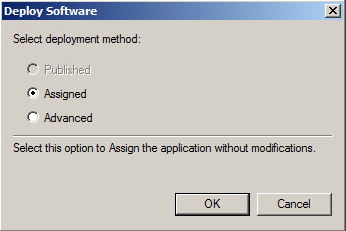 Choose the deployment method Assigned and click OK.
Now that the software installation package has been defined, the GPO will be applied the next time the computers within the OU are rebooted. Note that Win XP clients may require two reboots before the policy is applied.